ORONHYATEKHA (meaning “burning cloud,” baptized Peter Martin), physician, office holder, administrator of a fraternal order, and author; b. 10 Aug. 1841 on the Six Nations Reserve near Brantford, Upper Canada, grandson of George Martin*; m. 28 Aug. 1863 Ellen Hill (Karakwineh, meaning “moving sun”), great-granddaughter of Joseph Brant [Thayendanegea*], and they had six children, of whom a daughter and a son survived to adulthood; d. 3 March 1907 in Savannah, Ga, and was buried on the Tyendinaga Reserve near Deseronto, Ont. Although it is difficult to assemble a balanced picture of Oronhyatekha’s life and career – biographies written during his lifetime are marred by hagiography and embellishment, much of which the subject propagated – it is still possible to present an outline of his achievements. Born into a Mohawk family on the Grand River, he learned early to take advantage of the resources at hand. In 1846–54 he attended the New England Company’s industrial school near the reserve, perfecting his English and learning the shoemaker’s trade. Following graduation he attended the Wesleyan Academy in Wilbraham, Mass. (1855–56). His taste for retrospective mythmaking begins at this point: numerous biographies have him claiming to have cut wood for his upkeep. More likely, the Methodist congregation on the reserve helped subsidize his studies. Apparently he taught school there during the summer months. Between 1857 and 1860 he studied at Kenyon College, an Episcopal school for men in Gambier, Ohio. According to his own account, he completed the four-year degree in only three, graduating at the top of his class. After he had returned home, an event occurred which, in his memory, changed the course of his life. In 1860 he was chosen by the chiefs of the Six Nations Council to deliver an address of welcome to the visiting Prince of Wales. At age 19 Oronhyatekha possessed the striking physical appearance and bearing that would be his signature throughout his public life: he was six feet tall and a portly 230 pounds, with gleaming copper-coloured skin and large, protruding eyes set in an enormous head. His mediocre two-minute address, in English, was greatly enhanced by his deep voice. The prince was reputedly so impressed that he invited him to further his education at the University of Oxford in England. Though there exists some doubt as to the prince’s sincerity, Oronhyatekha did go to England later in 1860 and studied at Oxford under the tutelage of regius professor Henry Wentworth Acland, who had accompanied the prince to North America. It is not certain what program Oronhyatekha followed, but he did not come back as a medical doctor, as his later advertisements would claim. In 1863 he returned to Canada and married. The following year he entered the University of Toronto, where he received an mb in 1866. He completed his studies at the Toronto School of Medicine in 1867, passing the final examinations with middling results to obtain an md. While at the university, he joined its militia corps as well as the 2nd Battalion of Rifles (Queen’s Own Rifles of Toronto), good training grounds for his later competition in rifle-shooting at Wimbledon (London). His first affiliation with the lodge system also occurred during his university days: in October 1865 he joined the masonic order. Between 1867 and 1878 Oronhyatekha attempted to establish himself in medical practice. Developing a taste for clever advertising and an eye for contemporary need, he settled in Frankford, Ont., and billed himself as an Oxford physician who had studied with Dr Acland and whose specialty was diseases of the throat and lungs and nervous disorders. 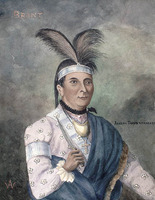 Since Frankford was not far from the Tyendinaga Reserve, he was able to conduct a booming practice with the Mohawks there after he changed his newspaper advertisement to include “Indian cures and herbal medicines.” By 1870 he was well enough established within the medical community to be elected first secretary of the Hastings County Medical Association. About 1871 a Dr Lucas invited him to become a partner in a practice in Stratford. The ambitious young doctor accepted and soon became involved in his only foray into active politics. 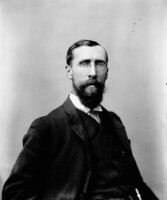 He handled the campaigning for the Conservative party, evidently in the federal election of 1872, in Wallace Township, north of Stratford, and possibly in other rural areas. 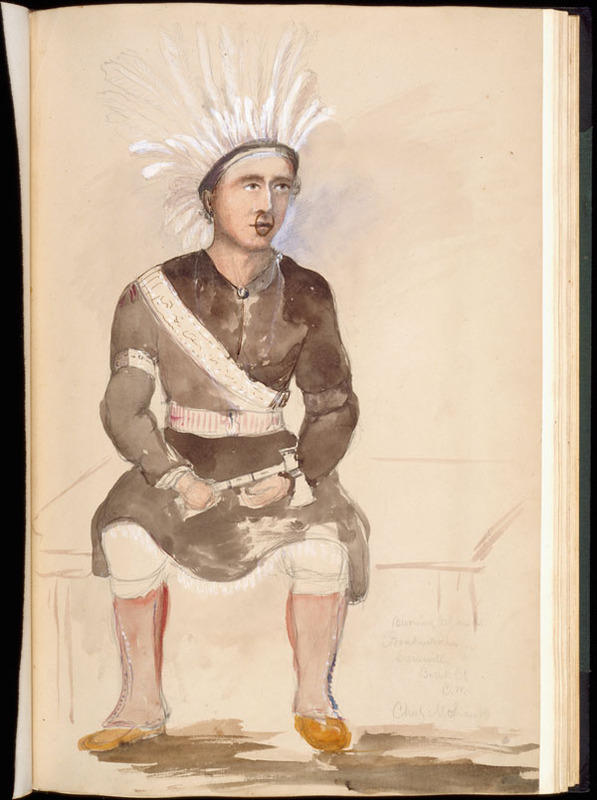 It was at this time that he met Sir John A. Macdonald*, who recommended his appointment by the government as a consulting physician to the Mohawks at Tyendinaga. 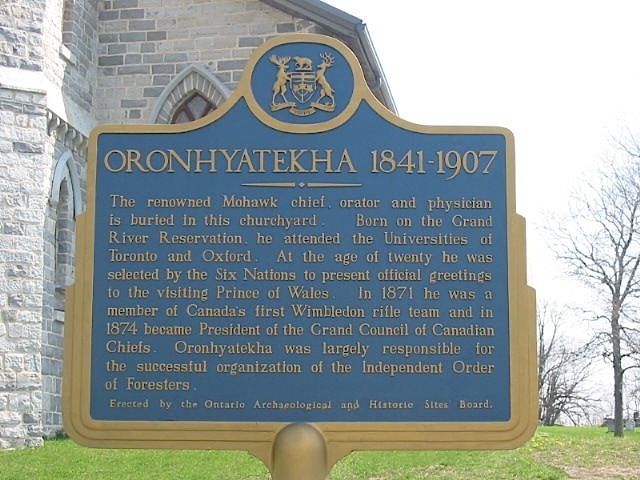 Oronhyatekha happily took the position and moved to Napanee in 1873. He built a huge house for his family of four but his annual salary of $500 was hardly enough to keep him in the style he felt appropriate to his new station. He tried to augment his income by buying a half interest in a general store at Mill Point (Deseronto). He was soon bankrupt – he claimed he extended credit too generously – and after mortgaging all his property he started a new practice in London, Ont., in 1874. In London Oronhyatekha advertised as an Oxford physician and a former government official. To gain the social contacts he seemed to crave he joined a series of fraternal, temperance, and masonic organizations; he even became a member of the Orange order. His most notable affiliation occurred in February 1878, when he joined Court Dufferin No.7 of the Independent Order of Foresters. 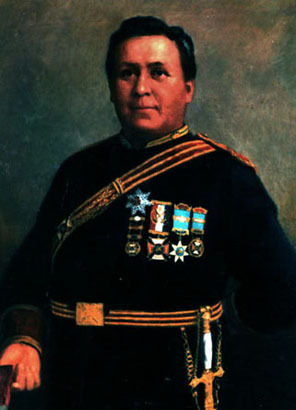 Oronhyatekha’s acceptance was remarkable, since the constitution of this American-based fraternal order stated that it was open only to “white males.” Through his previous fraternal activity and his standing within the community, however, he had gained sufficient status among Orangemen – only Orangemen were admitted to the IOF – to have a special dispensation granted. Oronhyatekha took to the IOF and the concept of fraternalism like a born-again Christian to the Bible. He described his version of a fraternal society as one based upon brotherly love and the principle of insurance. In such an organization all members pooled their resources to help those in need and protect individuals and families against uncertain futures, especially in Victorian Canada, where low industrial wages and high death rates due to disease and accident prevailed. According to official reports in Ontario after 1892, there were over 90 mutual-aid and fraternal societies in Ontario alone, and one-third of the male population belonged to at least one. Charges after 1878 that Oronhyatekha joined societies merely to advance his social standing are largely unfair in view of his almost frantic, unsalaried activity with the IOF from the start. Soon after joining the financially troubled organization, he was elected high chief ranger of its Ontario High Court. Between 1878 and 1881 he travelled throughout the province at his own expense preaching the gospel of fraternalism in small communities. His efforts, however, were undermined by a group of Canadian lodges that wanted to withdraw from the American body. The benefits paid out as a result of a high mortality rate in the southern states had seriously taxed the society and, after its treasurer ran off with funds, the secessionist lodges broke off and formed a parallel organization, the Canadian Order of Foresters. The self-proclaimed head of the anti-secessionist movement, Oronhyatekha was able to bring enough members from the remaining Ontario lodges to Ottawa in June 1881 to reconstitute the IOF as a new fraternal society. He was elected its first supreme chief ranger but the future could not have looked very promising. The new IOF had only 369 members and faced a debt of $4,000; and some members accused him of falsifying the vote to get elected. A court of inquiry cleared Oronhyatekha of the charge and he was soon ready to begin his life’s work – the expansion of the IOF throughout North America and abroad. In large measure he would accomplish his goal: at his death in 1907 the IOF boasted over one-quarter of a million members throughout the world and $11 million in liquid assets. Oronhyatekha’s first task was to restructure the constitution of the IOF to put it on the road to solvency. The major change was the replacement of dues levied on the death of members by a system of age-graded assessments, which would prevent the order from periodically being swamped by postmortem claims. The new constitution also provided for an untouchable reserve fund, regardless of benefits paid out. To minimize the rate of death among members, Oronhyatekha insisted upon strict medical examinations for all and he banned anyone with the slightest risk, including those even remotely connected with the liquor industry. Age-graded assessments meant that a young man with a low income could likely afford the modest monthly payments needed to protect his family against losing its sole breadwinner. Oronhyatekha worked to minimize payments so the truly needy could join. Old-line insurance companies found it difficult to match the IOF’s rates and Oronhyatekha proudly called his society “the poor man’s order.” Perhaps the most winning aspect of the new IOF was its cradle-to-grave welfare benefits, which were gradually expanded during the 1880s. Assisted by its federal incorporation in May 1889, the IOF was able to offer by 1891, in addition to life insurance, a pension plan, weekly sick benefits, disability insurance, and funeral costs. Although Oronhyatekha also publicized his medical practice in the Fraternal Monitor, he largely abandoned medicine to devote his energies full time to the IOF, which in 1888 moved its head office from London to Toronto. During the 1880s he travelled across Canada and the United States promoting fraternal societies over conventional insurance companies and financial protection for the working classes. By 1890 many new lodges had been opened and Oronhyatekha was perhaps North America’s best-known advocate of fraternalism. As such, he came under the watchful eye of critics, among them insurance executive William McCabe, who questioned the actuarial soundness of IOF coverage. Somewhat by chance Ontario had appointed its first inspector of insurance, John Howard Hunter, in the same year that Oronhyatekha took over the IOF. The two locked horns in 1888 when Hunter attempted to have fraternal societies put under his inspection. Oronhyatekha led the resistance, claiming that the province was actually trying to control the activity of workers deemed revolutionary. 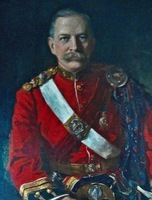 He won this round but a series of fraudulent societies was subsequently found to be operating in Ontario and Hunter’s proposal was legislated in 1892. Resigned to inspection, Oronhyatekha remained opposed to the clause which forbade new foreign societies from entering Ontario, and he would continue to argue with Hunter over what constituted an adequate reserve and the related question of rates. By this time he had enrolled the IOF in the National Fraternal Congress, the American umbrella organization, and was fearful that it would retaliate against the IOF as a result of Ontario’s exclusionary policy. To guard against further government interference, later in 1892 he organized and became first president of the Canadian Fraternal Association. In 1896, at the annual meeting of the CFA, Hunter promoted the adoption of mortality tables that he had devised for use by all insurance companies. Since these tables would mean slightly higher dues, Oronhyatekha, who had always played up the IOF’s low rates, initially opposed adoption. When the NFC accepted Hunter’s rates in 1899, however, his hand was forced because he wanted to be its president. He was elected in 1899 and the Hunter tables were adopted by the IOF that same year. The 1890s may be termed the golden years of the IOF and Oronhyatekha’s flamboyant direction must be credited for its success. He appeared to spend little time dealing with internal administration. Indeed, many contemporaries noted his lack of knowledge of actuarial science and one biographer, E. J. Dunn, claimed his speeches were full of “fraternal bunk.” Instead he travelled around the world, opening new lodges, few of which would survive long after his death. What did survive from his travels was a large collection of bric-à-brac, including Amerindian relics, artefacts from India, skulls, stuffed birds and rodents, an Egyptian mummy, and a gilded replica of Edward VII’s coronation chair, which he used in his office for a time. Oronhyatekha both studied and exploited public taste and opinion. Success in late Victorian Ontario meant presenting the IOF as a sound business operation run by sober, Christian men dedicated to the British crown. With more than a little contradiction in style and execution, he fused these elements in innovative ways that never failed to attract attention. Indeed, his inclination to bold display and lavish self-promotion led another biographer, Gerald Anglin, to call him a “Barnum let loose in the insurance business.” At the annual Toronto Industrial Exhibition of 1894, for example, he set up a huge “open house” tent adorned with British flags and surrounded by bands to commemorate the 20th anniversary of the IOF (Even though the order was virtually a new organization in 1881, Oronhyatekha wisely insisted that its original source was the lodge founded in Newark, N.J., in 1874. The use of this date ensured that the IOF could not be excluded from the United States as a foreign society.) In the early 1890s Oronhyatekha decided the IOF needed new accommodations to reflect its prosperous status in Toronto. The Temple Building, an imposing, architecturally advanced structure built at Bay and Richmond in 1895–97, became the centre-piece in his showy but masterful promotion of both the IOF and its supreme chief ranger. To mark the Temple’s opening and his own service, he commissioned Walter Seymour Allward* to create a life-size bronze statue of himself. The visit of the Duke and Duchess of Cornwall in 1901 could not, of course, go by without a suitable display of affection from the IOF. A massive arch with a crown in the centre was constructed across Bay Street from the Temple, which itself was strung with flashing light-bulbs. Oronhyatekha did not miss his chance: he kept the lights flashing for a month while the IOF prepared a booklet portraying him flanked by the royal couple. As a result of his brilliant marketing, membership climbed dramatically after the visit. It would be unfair to present Oronhyatekha merely as a promoter. He truly seemed to believe in all aspects of fraternalism, especially in his later years. His History of the Independent Order of Foresters (Toronto, 1894) contains the fullest and most coherent account of his philosophy. In 1903 he devoted land he owned on Foresters Island in the Bay of Quinte to an orphans’ home to be financed through members’ contributions. Sadly, his taste for excess was evident in this project: instead of a modest home he built a miniature castle. A white elephant almost from the start, it was closed shortly after his death. He also had plans to donate his own Sherwood Castle on the island as a home for elderly and disabled members. And when a disastrous earthquake struck San Francisco in 1906, he ordered a contribution of $15,000 to the relief fund. In Oronhyatekha’s mind, fraternity constituted not simply insurance but the entire philosophy of self-help and mutual aid among members. Little documentation exists for his activities other than the promotion and marketing of the IOF. Its newsletter, the Independent Forester, listed him as senior editor as well as the organization’s chief medical examiner. It is difficult to imagine when he found the time to participate in these pursuits since he travelled abroad so much. During the early 1890s he attempted to revive his medical practice in the IOF offices but this venture does not seem to have been successful. He was an ardent defender of his native heritage, used his Amerindian name throughout his life (only his biographers called him Peter Martin), and wrote two articles on the Mohawk language. It is not clear, however, that he had much to do with his people. Although in 1874 he was elected president of the Grand Council of Ontario, a native body, the position appears to have had little activity associated with it. His main residence, the Pines, was at Deseronto on the Tyendinaga Reserve, but he spent hardly any time there, preferring instead to maintain rooms in Toronto. A Conservative in politics, he was often asked to run for public office. He always refused, arguing that as supreme chief ranger he could not risk associating the IOF with any one political party. (He was fond, however, of saying that Sir Wilfrid Laurier* had a “close association” with the IOF.) In terms of business outside the IOF, in 1900 he helped organize and was president of the Union Trust Company, a private venture, but even it was established, starting the next year, to invest the funds of the IOF, which held most of its shares. Oronhyatekha had succeeded in transforming the IOF from a bankrupt organization into the largest fraternal body on the continent and towards the end of his life should have been able to enjoy the fruits of his labour. His final years were, however, clouded by the loss of his wife, Ellen. Apparently she had become a virtual recluse after the death of a son in 1881 and had rarely left their home in Deseronto. Though Oronhyatekha’s work for the IOF did not leave him much time to spend with his family, her death in 1901 greatly affected him and he seemed to age quickly afterwards. At the same time the diabetes from which he suffered was wasting his massive frame. He nevertheless kept up his annual meetings with the fraternal world. His final contribution to the IOF came in the fall of 1906, when he was called before the royal commission on life insurance to give a full account of the order’s operations, including the controversial investment practices of Union Trust. He and the IOF had long been under public suspicion, in part because of its remarkable success and the activities of the extravagant Oronhyatekha. Despite his sickness – he was too weak to stand during six days of gruelling examination – and despite the paucity of his actuarial knowledge he presented an impressive array of evidence and explanation. When the commission made its report public in February 1907, the IOF was given essentially a clean bill of health. In assessing the order and Oronhyatekha, however, the commissioners writhed with frustration over the IOF’s circumvention of federal insurance regulations and Oronhyatekha’s skill at influencing sympathetic legislation. Sadly, over the previous months, Oronhyatekha’s condition had worsened and he was ordered by his doctor to a southern climate for the winter. Shortly after stopping off to visit President Theodore Roosevelt, he died peacefully in Savannah on 3 March 1907. Characteristically, he had organized the details of his funeral, and it was a lavish affair. His body lay “in state” at Massey Music Hall in Toronto; within a four-hour period on 6 March, over 10,000 people paid their respects. That evening a memorial service was conducted at St Peter’s Church (Anglican), which Oronhyatekha had attended. 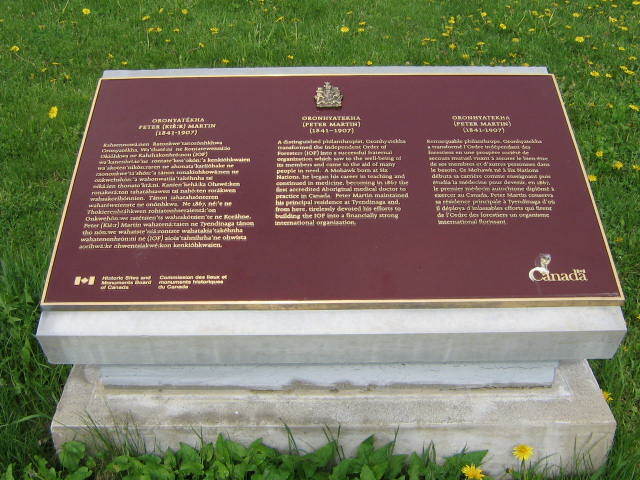 The following day his body was transported in a specially commissioned train for a family service at Christ Church on the Tyendinaga Reserve, where he was interred in a concrete “ghoulproof” tomb beside his wife and sons. Oronhyatekha’s two articles on “The Mohawk language” appear in the Canadian Journal (Toronto), new ser., 10 (1865): 182–94 and 15 (1876–78): 1–12. The collection of artefacts which he assembled on his travels was donated to the Independent Order of Foresters in 1904 and is described in its Catalogue and notes of the Oronhyatekha Historical Collection, comp. F. B. Cumberland ([Toronto, 1904]). The collection was presented to the Royal Ontario Museum (Toronto) in 1911. AO, RG 22, ser.340, no.19689. Univ. of Toronto Arch., A73-0026/352 (94); P78-0158 (Univ. of Toronto, class and prize lists), 1864, 1866. Daily Mail and Empire, 7 March 1907. Gerald Anglin, “The strangest insurance company in the world,” Maclean’s (Toronto), 64 (1951), no.3: 10-11, 44. Ethel Brant Monture, Famous Indians: Brant, Crowfoot, Oronhyatekha (Toronto, 1960). Can., Parl., Sessional papers, 1906/7, no.123a. Canadian Fraternal Assoc., Journal of proc. (Guelph, Ont. ), 1893–1908 (copies at AO); Minutes of the preliminary convention, of the constituting meeting, and of the first annual session . . . (Toronto, 1892; copy at AO). Canadian Journal of Medicine and Surgery (Toronto), 21 (January–June 1907): 256. Canadian men and women of the time (Morgan; 1898). E. J. Dunn, The builders of fraternalism in America (Chicago, 1924; copy at the Independent Order of Foresters Museum, Toronto). Fraternity: a compilation of historical facts and addresses pertaining to fraternalism in general and the fraternal system in particular . . . (Rochester, N.Y., 1910). Independent Forester (Toronto), 1880–1907 (copies at the IOF Museum). Warren Potter and Robert Oliver, Fraternally yours: a history of the Independent Order of Foresters (London, 1967). Prominent men of Canada (Adam). C. E. Rich, “Dr. Peter Martin, m.d. 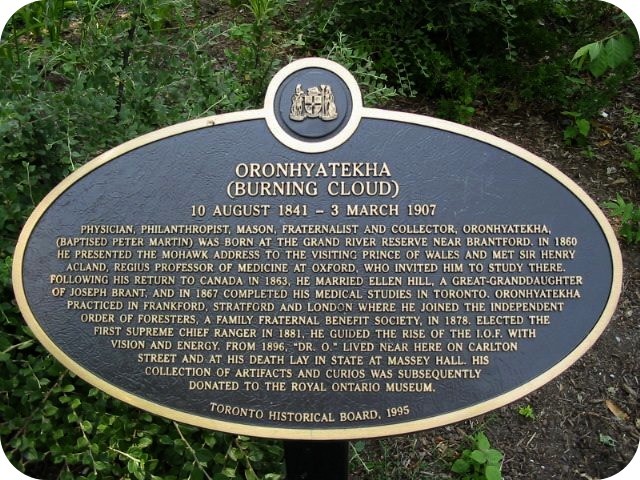 ; Oronhyatekha; ‘Burning Cloud,’” Canadian Masonic Research Assoc., Papers, 1949–1976 (3v., [Toronto], 1986), no.107. F. G. Weir, “Great Indian characters” (photocopy at the IOF Museum, apparently from a publication entitled Onward, 1 Feb. 1930: 38). Gayle M. Comeau-Vasilopoulos, “ORONHYATEKHA,” in Dictionary of Canadian Biography, vol. 13, University of Toronto/Université Laval, 2003–, accessed April 19, 2019, http://www.biographi.ca/en/bio/oronhyatekha_13E.html.